Note: To play Attila: Scourge of Rome, you need a copy of Cataphract. The module includes 140 counters depicting the Huns and other barbarian notables, including the Visigoths, Alans, Burgundians, Franks, Saxons, and Gepids. For the Romans, the Cheiroballistra artillery makes its debut. Attila includes a full size map. Cataphract is required for play. 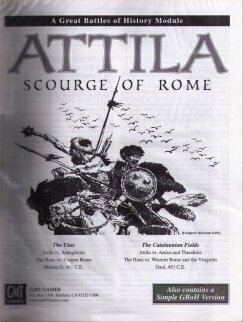 The Attila module introduces some changes to the Cataphract rules including the elimination of the Size rating and the reassessment of the missile fire effectiveness of the composite bow based on the latest research.In addition, Attila includes special rules to account for the unique style of steppe warfare practiced by the nomadic Huns - the feigned retreat along with rules covering defections and barbarian impetuosity. Simple GBoH versions of both battles are included.